This movie is fascinating. 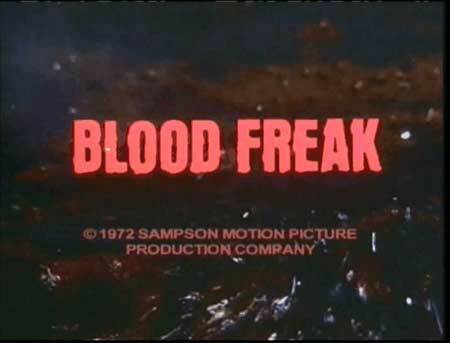 It is the only anti-drug Christian splatter slasher movie that exists (I think). I think I could probably watch this movie any day, any time and I would sit there, unable to look away. Truly a compelling film. Herschell, a big hunk of a guy on a motorcycle, is just kind of riding around when he encounters Angel, whose car has broken down. He fixes things up for her and in return she invites him to her gorgeous sister Anne's drug party full of filthy hippies. Neither Angel nor Herschell are interested in drugs, and Angel just sits there lecturing people about how awesome Jesus is. Herschell is totally spellbound, so no matter how many times Anne tries to seduce him, he is just not interested. After a little bit of this, they leave. What they were trying to accomplish, I don't know. Herschell gets a job helping around the house and then one fateful day Anne is just sitting there in her swimsuit and Herschell has had just about enough of her pestering so he gives in and smokes a joint and is immediately and hilariously addicted, complete with a scene where he goes a couple of days without a joint and is on the ground shaking, demanding a hit, man. But that is the least of Herschell's troubles! A lethal mixture of pot and experimental turkey meat turns his head into a chicken head and now he has an incredible urge to drink human blood! Like a chicken does! And when he kills, the same three second audio clip of a lady screaming is played over and over and over and oh my god it is so funny. So needless to say there is a lot going on in this movie. Can Herschell turn back to normal? Will Anne get over the fact that her boyfriend has a chicken head (she doesn't seem to mind so much once she gets used to it)? What happened to Angel? Every once in a while the director of the movie shows up onscreen to tell you about how bad drugs are stuff, all while smoking like a chimney. At one point he starts coughing so badly he cannot finish his sentence and you just sit there watching, hoping he doesn't die right there on camera. So that's that and you should watch this any chance you get.